The one thing that matters us is to be true to yourself. One of the greatest challenges in life is having the courage to be and own all that you are, without having to apologize, without the need for creating excuses and without having to hide behind any mask to cover the truth of who you truly are because of the fear of rejection. Well, it is true that there is always be someone prettier, smarter, younger and better than you, but they just will never be you. Bear in mind the fact that no matter who you are and whoever you choose to be, you will always be judged and criticized by others. 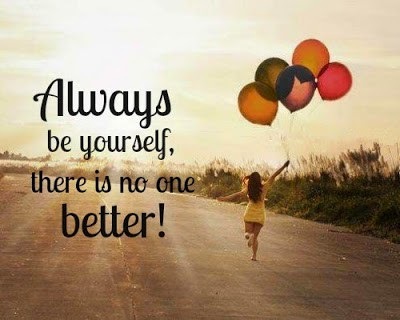 Therefore, trying to be anyone else but you is a waste of the person you truly are. Instead of sabotaging yourself, why not try to love yourself, value yourself, look out for yourself and stick out for yourself while simultaneously caring for those around you. Instead of hating yourself for all your flaws and imperfections, why not just embrace and embody that beautiful individual within you and why not love and value all that you already have, so that when the right time comes, the right people not only could and will unconditionally accept and love the real you, but also continuously remind you that you are beautiful just the way you are and guide you to grow into the best version of you. Since people always come and go, there comes a point in life, when you realize who truly matters, who never did and who always will, thus realizing who deserves you at your best and who could handle you at your worst. In other words, the right people will always stay and be true to you no matter what because they appreciate and accept you for you, only and only if you love and value your trueself. Hence, be happy with who you are today and let your positivity inspires your journey into tomorrow and every other day. If you are not happy with yourself, do something about it, start with being accountable for your own life, by owning your choices and mistakes, and willingly take the necessary actions to improve upon them. Above all, be true to YOU, so that the right people could be true to you and love yourself, as no one else will unless you yourself do.